2) the 'new' spiral cable is in some way incompatible with the cc system. The dealer gave me the song and dance and wanted to charge me for 'diagnosing' the problem. I said basically, I used the cc to get here and after you worked on it, it doesn't work. Last edited by 06YarisRS; 08-01-2018 at 04:59 PM. Take it back to the dealer and raise holy hell! Last edited by dogsridewith; 07-20-2018 at 07:22 AM. I just may do that. I didn't have time to hang around today as we were heading out of town. The service manager came out told me that there was a recall and that they were told to remove all cruise controls from Toyota cars. I asked for a reference to the recall and he couldn't give me one. So, I asked him if they disconnected mine and he said "no". Buncha BS imo. Thanks. I'll call the dealer back and if they don't offer to fix it, I'll then call customer service. Aftermarket cruise control or stock? I remember hearing about them removing the aftermarket Rostra systems from some of the Yarii and other cars for some reason. I'm not 100% sure. I got it from CT Scott here on the site. I think it is OEM. Does anyone know how to test the stalk with a multimeter? Yes, it's easy to test. Unplug the control stalk and connect your multimeter on ohms range across the contacts onthe plug. With nothing operated, it should be open curcuit. Press the "on/off" button on the end of the stalk, and you should see 0 ohms - a short circuit. The "set/decelerate" position should read between 567 and 693 ohms. The "resume/accelerate" position should read between 216 and 264 ohms. The "cancel" position should read between 1386 and 1690 ohms. Thanks very much!!! I will do this testing and report back. Cheers! Once again, Thanks for this. I will be back home in a day or two and will tackle this. If you don't mind, could you clarify a few things for me? When you say the contacts on the plug, do you mean the end of the wire that comes from the stalk and plugs into the clock spring? If so, is there just two terminals I need to concern myself with? I think the horn wire comes out of that too. Secondly, Should the readings be different when the stalk button is in the "on" and "off" positions? If so, one position should be 0 ohms. What should it be in the other position? I really appreciate the help with this. S in the plug. Ignore the horn wire for this test. All the switch functions on the stalk are momentary. 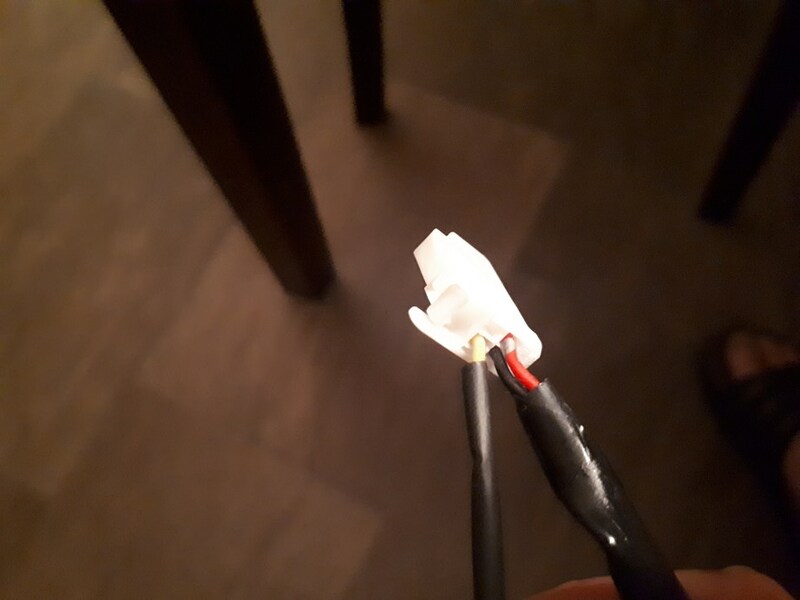 If the stalk is in its rest postion, you should not see any connection between the pins. You should see a short circuit while pressing the On/Off button, and the other values I mentioned before when operating the stalk to one of the Set/Resume/Cancel positions. 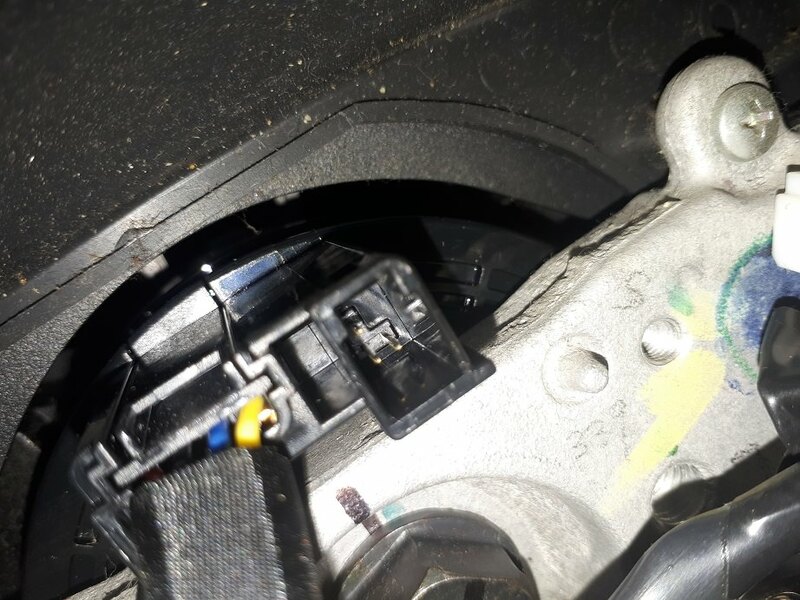 If you can find connector C3 in the steering column, it should have only 2 wires in it, blue and brown. With the ignition swithed on, shorting these 2 wires should turn on or off the cruise control indicator light in the instrument cluster. Hope you get it working soon. I would be lost without my cruise control. Thanks! I don't have the indicator light as I opted out of that in the kit. Kinda wishing I'd got that now. When I first looked at this - after the dealer worked on it - I did get around 12 V on the red wire coming out of the clock spring (multimeter probe on the red wire pin and black grounded on teh steering column). I am hoping that that is all that is required to make the clock spring compatible with CC. I fear that my new clockspring does not have the necessary wire for the CC. Not sure if another wire can be run from elsewhere if this clock spring is not compatible. I'm guessing that I can count on the stalk being good. The clockspring the dealer installed has 3 pins - horn (yellow wire in top left position), black and red (from CC stalk) in lower position left to right respectively. Tomorrow I will check the wire that goes to the ECU as suggested by both Kevinj93 and CT Scott. Thanks again gentlemen for the invaluable help! Last edited by 06YarisRS; 07-22-2018 at 10:11 PM. If it's a manual transmission, you might also want to check the switch on the clutch pedal. This should be closed (zero resistance across the contacts) when the pedal is released. If this switch is open circuit, or the wiring is disconnected, the cruise control will not engage. It's an automatic. Thankfully, one less thing to check! The dealer is at least working with me now. Their shop foreman also believes the problem lies with the new spiral cable. They offered to pay for a used spiral cable as they claim they cannot get one of the 'older style' spiral cables. Of course they cannot install it. It seems that my car originally came with a #84306-22010 and the new one is a #0400407122. A call back to the dealer parts dept to confirm the original part number from my car and the counter guy says he can order the original for $438.00. So, once again, conflicting info from the service manager. Hmmm. I ordered a #84306-22010 from eBay for $11.00. We shall see how it works.